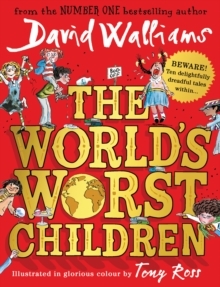 From the world's favourite author, David Walliams - ten cautionary tales and a delightfully dreadful cast of characters; all in a gorgeously gifty FULL COLOUR format! Are you ready to meet the World's Worst Children? Five beastly boys and five gruesome girls! * Like Sofia Sofa - a TV super-fan so stuck to the sofa that she's turning into one! * Or Dribbling Drew - a boy whose drool gets him into trouble on a school trip! * And not forgetting Blubbering Bertha - a girl who bawls and tells terrible tales! Also featuring a special appearance from fan-favourite Raj! From Number One bestselling author David Walliams comes this collection of wickedly funny, deliciously mischievous tales, illustrated in glorious colour by the artistic genius Tony Ross.